Dec. 26, 2018, 10:55 a.m.
Dec. 19, 2018, 11:54 a.m.
Nov. 28, 2018, 10:14 a.m.
Go on Instagram anyday of the year pretty much and see *CBC* being ridden as it was 20 years ago. Loamers are not just for locals these days. Nov. 2, 2018, 10:23 a.m.
My Fox 36 went to the new Fox Service centre for a warranty CSU. S-Werx sent it to them. OGC has stopped stocking Fox stuff completely now I suppose. Sept. 28, 2018, 10:09 a.m.
Re: Helmet or Handlebar Lights? I have the Gemini Duo and the single for the handlebar. Tons of light. For me I think the light is maybe too white/hard, but I have little experience with riding lights in recent years to know if something more expensive has a beam patter that gives more depth. But for me, they offer a crazy amount of brightness, and very long battery life. Sept. 3, 2018, 8:32 p.m. The Q&A in BIKE Mag asked about the shock choice. Scott's Marketing guy said the reason people look fir piggyback shocks is because they are looking for more air volume. Haha WHAT?!! Aug. 31, 2018, 9:40 p.m.
Ahh Scott just squeaked their 10K build under 30lbs, what a relief. Another long travel Enduro destroyer with an XC shock and thin tires ;-) Maybe it's not Enduro, maybe its the category-shifting Downcountry-duro?? Aug. 19, 2018, 11:18 a.m.
Aug. 17, 2018, 11:13 p.m.
Yeah...Rocky, Devinci, Giant, Knolly etc. Do the big boys ship direct to Canada (Trek, Specialized)? 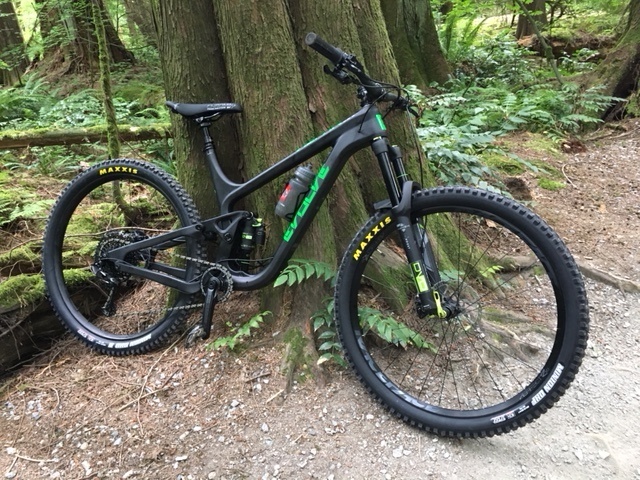 Aug. 17, 2018, 9:37 a.m.
July 25, 2018, 8:30 a.m.
My new steed - 2018 Evolve Alpha 29er - 160mm/150mm DVO suspension, Eagle and shy of 30#. July 4, 2018, 1:10 p.m.
Another odd thing is that I had a few bike shops completely refuse to service my faulty brakes or dropper post, even if I fully paid for the parts and labour and didn't worry about the warranty piece. They basically decided that they're busy enough with their own clientele and don't want to create longer service times by fixing direct-to-consumer brands, I guess? Makes no sense. You mean to say a guy who walks into a shop with a reverb to be rebuilt deserves tough love because they didn't buy it there? I guess tough cookies for guys on their road trip from out of town? I would love to know who the shops are this is nuts! See Dave at Bicycle Hub, he's fast, will bend over backwards and prices are better than most if not all shops. July 2, 2018, 2:01 p.m.
Re: EThirteen 29 tire local? Thanks guys, the TRS+ was on sale for $50 USD so I did 1X race and 1X TRS+. Totally reasonable prices IMO. I'm definitely not unhappy with my Minion 2.5WT/Aggressor 2.5DD. It's just that they are getting haggard. Apparently to arrive Friday July 6. Not holding my breath though....but fingers crossed for TransBC. I ran the same Maxxis combo and switched to a Shorty2.5WT and a HR2 2.4WT and love the combo much better. HAven't tried a Shorty in the 29er size yet. Have had DH2s on the front and back. I do like the traction, but I burn through the rears in about 2-3 weeks. And this year, for whatever reason, I've had bad luck killing EXO tires at the bead. After moving to Double down, I'm killing rims...unrelated I'm sure. The bonus of DD though is that I can ride out on a broken wheel (thrice), and still reuse the tire (even tubeless)! July 2, 2018, 11:41 a.m.
July 1, 2018, 9:56 a.m. Anybody have any luck finding a shop in the North Van/Van area that carries these? I'm curious to try these in 29. T-mac mentioned Velocity in Langley. Any others?